A familiar face is now welcoming visitors to Fernie Forge in Hosmer. 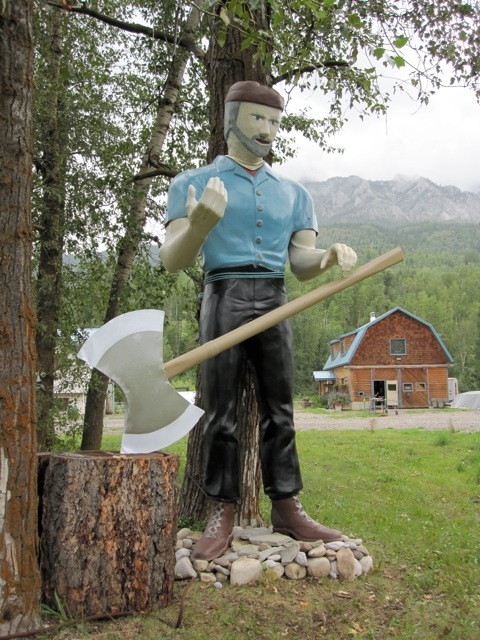 A 15 foot tall fibreglass statue of lumberjack Paul Bunyan stood outside OK Tire, in Fernie for over 40 years, but retired from his post two years ago when the business closed. It was bought by Sandra and David Barrett from Fernie Forge and moved to their premises in Hosmer. Paul Bunyan is a mythological lumberjack who is usually believed to be a giant. “Paul Bunyan is a larger than life folk hero who embodies frontier Vitality” said Sandra. Sandra and David Barrett originally intended to replace his axe with a hammer to represent the blacksmithing business they own and operate in Hosmer. However, local people seeing him at the back of their shop have shared so many fond memories of his exploits in Fernie over the years that now Sandra isn’t sure about changing his trade. “I respect his heritage and would like to ask our visitors what they think,” she said. Fernie Forge is having an open house as part of the Columbia Basin Culture Tour on August 14-15 from 10-5. Traditional blacksmithing techniques will be demonstrated on the coke hearth at 2087, Highway 3, Hosmer. Look for the barn with a blue roof.